Although Carnival season and the 2018 Mardi Gras Parades actually kicks off on January 6th each year, Mardi Gras Day is Tuesday, February 13, 2018. All of the major New Orleans parades on the Uptown route are the 2 weeks prior to Mardi Gras Day, which brings the celebration to an end at 11:59pm. 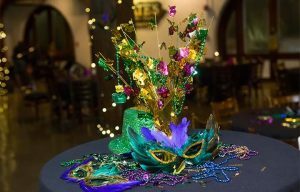 Lundi Gras is a day long celebration along the Mississippi River on Monday, February 12th and Lent begins with Ash Wednesday at midnight on February 14th. Located at 201 Julia Street, on the corner of Julia Street and Convention Center Boulevard, we’re located where many krewes line up before they roll and are in the center of all of the Mardi Gras action.